Integrin activation is an important mechanism through which cells regulate integrin function by manipulating the ligand affinity of integrins spatially and temporally. Structural and functional studies suggest that integrins can exist in different ligand affinity states – low, intermediate and high (reviewed in ). Crystal structures have revealed that integrin heterodimers, occur in an inactive, bent V-shape with the head close to the membrane-proximal regions of the legs , maintained by the α/β salt bridge at the inner membrane region and helix packing of the transmembrane (TM) region . This low affinity structure undergoes rapid, reversible conformational changes to increase ligand affinity, termed “activation” (reviewed in ). b) separation of the cytoplasmic leg domains (structural rearrangements detailed in ). This process facilitates integrin-mediated signaling, thus mechano-sensing and -transmitting. Integrin can be activated from two directions, from the inside by the regulated binding of proteins to the cytoplasmic tails, and from the outside by multivalent ligand binding. In either case, talin binding to the integrin β tails is an essential and the final common step (, reviewed in ). Though the two processes are conceptually separate, they are mutually cooperative i.e one can lead to the other. Some structural studies done with force application to mimic ligand/intracellular protein suggested that the combined action of these two events favor the transition from the closed, low affinity to a open, high affinity conformation of integrin . Activation leads to bidirectional signaling crucial in a variety of anchorage-dependent events such as adhesion, cell spreading, migration, polarity and organization of the ECM leading to physiological changes (reviewed in ). 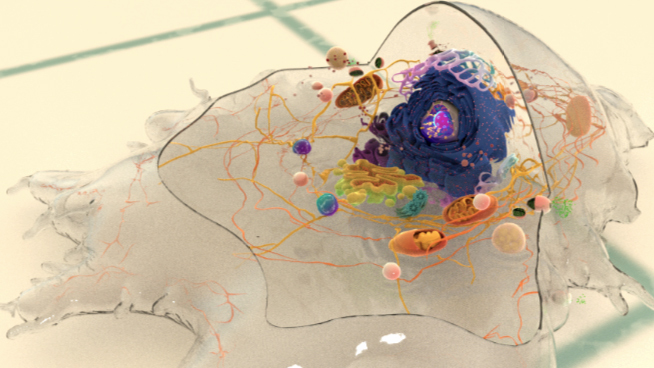 Here we discuss only well-established events that occur at the close proximity of integrin molecules localized on the plasma membrane. A. Low-affinity integrin has an inactive, bent, conformation. B1 and B2. Inside-out integrin activation by cytoplasmic proteins or Outside-in integrin activation via ECM ligands both lead to complete extension of the extracellular domains. C. The hallmark of open, high-affinity activated integrin is separation of the cytoplasmic leg domains. Signals received by other receptors foster the binding of talin and kindlin to cytoplasmic end of the integrin β subunit , at sites of actin polymerization. Substantial information on signaling pathway leading activation is available for integrin αIIbβ3 . Talin binds to integrin β-tail via F3 phospho-tyrosine binding (PTB) domain , a unique interaction with the membrane proximal (MP) region of the integrin (NPxY motif). This permits competition between conserved lysine on talin and an aspartic acid on integrin α essential for α/β salt bridge disruption and sufficient for integrin activation . Addition interactions through the basic patches in the FERM subdomain F2 helps to orient the β-subunit to promote spatial separation of the cytoplasmic domains . Kindlin is also an essential co-activator of integrin  and binds to a membrane distal NxxY motif on β-integrin via its FERM F3 subdomain . A preceding threonine patch on integrins β1 and β3 that gets phosphorylated  and a tryptophan on kindlin F3 are also required for binding. However, kindlins are not known to activate integrins on their own but may render integrin-specific effects (reviewed in ). The mechanism of crosstalk between integrin, talin and kindlin are not well established (reviewed in ). However, substantial data on the order of their binding is available. Latest Findings Talin is recruited directly to FAs from the cytosol suggesting that it does not bind to free diffusing integrins outside FAs  and also requires vinculin and F-actin for its activation . Hence it is believed that only F-actin anchored talin at FAs bind free diffusing integrin promoting its activation . 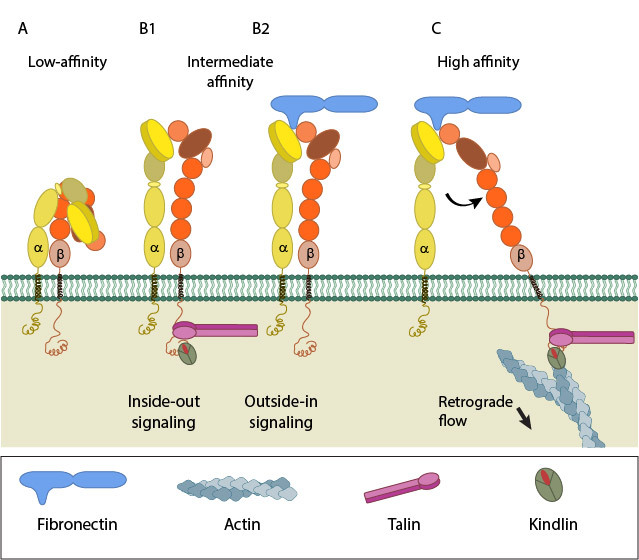 Talin can directly connect to actin while kindlin links through adaptors such as migfilin, filamin, FAK,VASP and α-actinin (reviewed in ). Ligand binding to external domain causes conformational changes that increase ligand affinity, modify protein-interaction sites in the cytoplasmic domains and thence the resulting signals. alteration of binding with signaling molecules (kinases, GTPases and adaptors) , that constitute dynamic adhesion structures such as focal adhesions and podosomes (reviewed in ). Nevertheless, whether clustering triggers outside-in signaling to facilitate integrin activation or occurs after integrin activation is uncertain (reviewed in ). What is the role of integrin clustering in focal adhesion assembly?